Description of "How To See God"
God is in all beings, objects, things and forms. As simple as this may sound, it is the most complex, for between the formless and the multiplicity of forms, there is infinity. Imagine, going down to nothing from the sheaths of your body, mind, emotions, feelings, thoughts, experiences, skin, bones, flesh, muscles and everything there is in the world to realizing that nothingness is the real being. I try to create my own spiritual practices, besides all the conventional practices that have existed for millenniums. One such practice is realizing that pain is not experienced by or is not part of the one who is actually living i.e. you. Our sense of living has never been affected, despite all the troubles and turbulences we undergo. Pain is experienced by the body but the sense of living doesn't. We experience pain because we identify with the pain and think of pain as an invasion from an external source i.e. caused by an external affliction. We think of ourselves as a whole being consisting of a body and mind and think of pain as something that has invaded this unit called body. Sometimes, I become the pain to evade pain for a snake doesn't die out of its own poison. I explore spirituality through unconventionality and that's what this book is about. 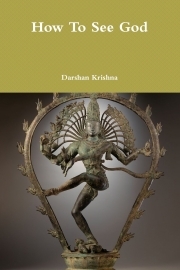 Darshan Krishna, trainer, teacher, ex-entrepreneur, journalist, blogger, writer and author of How To See God turned a spiritual enthusiast after a calamitously life-changing event that triggered an epiphany and thus penned this book full of the miracles of daily life, visions of God and God forms and secrets of life perceivable by the human mind by narrating his profound spiritual experiences, as witnessed and evidenced by him in this book. Reviews of "How To See God"